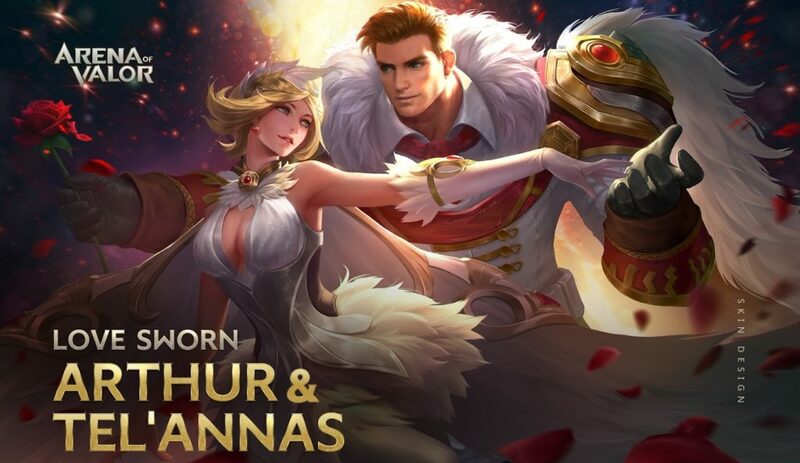 ‘Arena of Valor’ News: Valentine’s Day Events, Wiro Arrives, And Valor Series Week 2 Begins! I didn’t hit the weekly gold reward this week for the first time in about 4-5 months. A friend’s engagement party took precedence, and a series of events thereafter made it borderline impossible to get those daily matches in without looking like an ignorant recluse. But my 3-4 days away from Arena of Valor probably couldn’t have been timed better – barely anything happened in the last week! It’s going to be a short and not-so-sweet Arena of Valor weekly roundup today. Though, with Valentine’s events in full-swing, we could argue it’s sweeter than ever before! Let’s go, you love birds! Though the Chinese New Year event doesn’t fade away until the 11th, Tencent has decided to kick the Valentine’s Day event off a little early. Running from today to the same time next week (the day after Valentine’s), it’s essentially a carbon copy of the aforementioned event this one attempts to steal the spotlight from. Players can earn up to 6 tokens each day by completing certain criteria and trade them in for general skin tokens, Magic Crystals, and a surprise box that, much like the New Year one, probably just has another box inside! For those in a rush, you can grab the maximum tokens for each day just by playing two matches with a friend. It’s a chain reaction! Outside of the token redemption part there’s, well… another token redemption aspect to this event. We’re expecting Roxie and Elsu’s new Valentine’s skins (the Jazz Lovers set) to become available closer to the big day, but Tel’Annas’ and Arthur’s event skins from last year are available over the next 7 days for those able to gather up enough Vow of Love tokens. It isn’t really clear how we go about getting them just yet, but the theory it’s currently bugged and that we’ll simply convert them from general skin tokens once it’s fixed. You need a lot, though, so unless you’ve been hanging onto your tokens, don’t expect to stay purchase-free if you absolutely need one skin or the other. Xeniel’s Codex Chapter 4 Rewards Are Live! The leaks were true – and why wouldn’t they have been? – Xeniel’s Codex Chapter 4 features new skins, and even a new hero. Kicked off at the start of the week, the new Xeniel’s Codex chapter is another 6-week affair that tasks players with completing certain quests and goals to earn a bunch of extra rewards over the next month and a half. Paid players get access to rewards with each level, whereas free players will see significantly smaller returns on their time investment. The good news is that Wiro, the game’s newest hero, can be had for free on both sides of the codex – though paying players will unlock the “212 Warrior” at a much earlier codex level; so expect him on the battlefield from here on out. 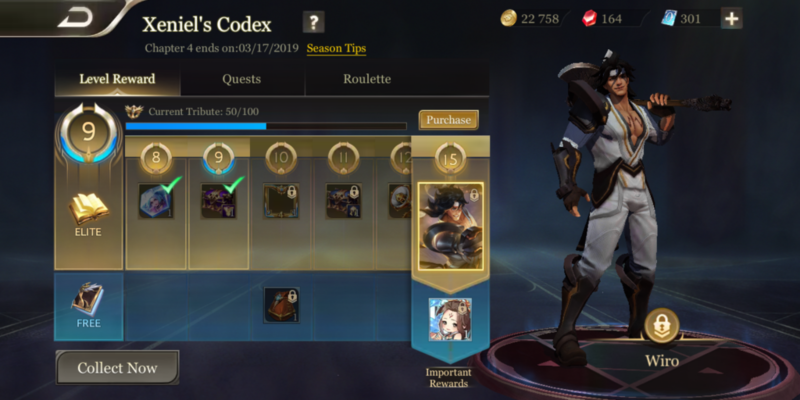 As for skins, paid players will get a second shot at a few choice skins available in past codex chapters, while unlocking two brand-new outfits for Annette and Yorn. Annette’s Wonderland skin is available at level 1 – or as soon as you pay to unlock the codex – with Yorn’s now famous Celestial Marksman skin being the final reward. In most cases you wouldn’t see that top-level skin out in the field for at least a month as players cap out on the quests needed to reach it, but Reddit has show that a handful of players wanted the skin so bad that they paid crazy amount of vouchers to buy their way to the end. They won’t have much to do over the next 6 weeks, but at least they’ll look good doing it. You won’t hear too much of Valor Series until the competition heats up in the Summer, but that doesn’t mean it isn’t happening. With qualifiers finishing up at the end of January, we’re entering the second week of “Regular” play – meaning it’s week 2 of 8 before we learn which teams will fight against each other in the deciding rounds of the Playoffs. Going by last week’s standings – which you can view over at the Valor Series Esports website – the usual suspects are working their way up the ladders once more. Taking advantage of the fact that 2-time champions Alliegance disbanded following the Arena of Valor International Championship late last year, previous contenders for the crown like Nova Esports, Team Queso, and Dino Riders are crushing the competition once more. Aside from a few newcomers, don’t expect many fresh faces in the latter stages of Valor Series 3. You’ll be able to watch the action unfold at 9 A.M PT tomorrow over on Facebook.